Cheesecake made healthier with soft tofu and light cream cheese! 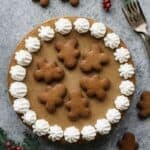 This light gingerbread cheesecake is filled with the best flavors of Christmas, and it makes a great addition to your holiday table! This recipe is sponsored by House Foods! For years, I’ve had visions of building a grand gingerbread house, a house decked out with icing decorations and gummy candy bling. Every December, I promise myself that I would attempt to make a gingerbread house. I even go through the effort of bookmarking several tutorials, but I don’t ever see it through to the end. Unfortunately, I won’t be getting around to making one this year either, as I am already across the Atlantic in England, getting ready to spend Christmas with my husband’s family. Alas, I will have to wait another year to fulfill my gingerbread house dreams, but that shouldn’t stop us from enjoying some good ‘ol gingerbread! 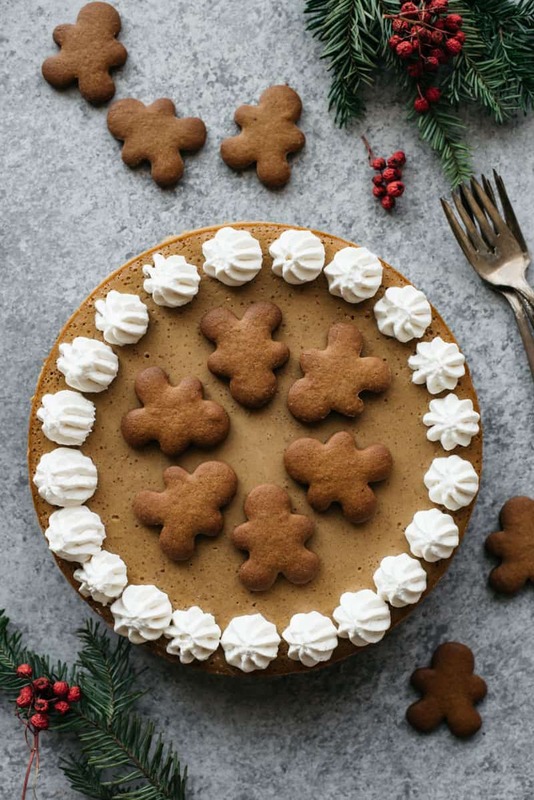 Let’s talk about this gingerbread cheesecake. I don’t eat cheesecakes often because I usually find them too heavy or sweet. 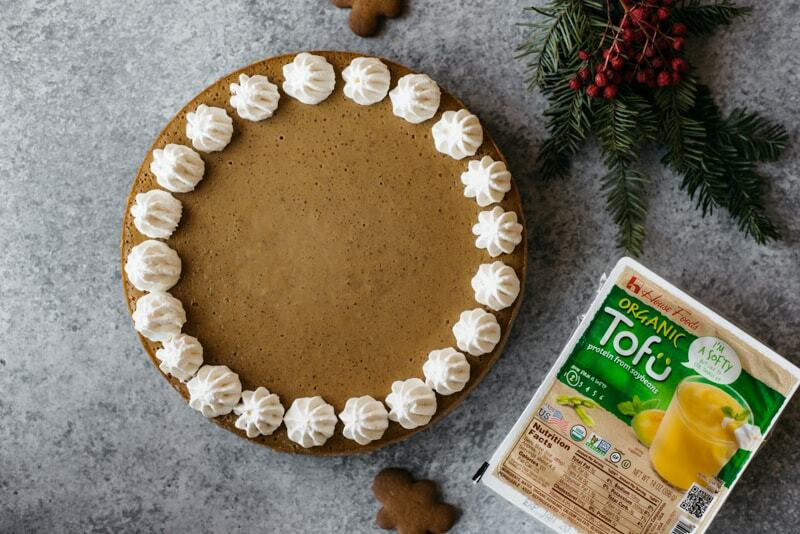 That’s why I lightened up this gingerbread cheesecake by making the batter with equal parts House Foods organic soft tofu and low-fat cream cheese. You’ll also find that there’s less sugar in this cheesecake than you would normally find in a cheesecake recipe. One of the trickiest things about baking cheesecakes is preventing cracks from appearing on the top. Often times, if you don’t cool a cheesecake properly, the surface will crack. The beauty about this tofu cheesecake is that you don’t have to worry about that problem. I made this cheesecake a few times, and I didn’t notice any cracks appearing on the surface. However, the surface won’t appear completely smooth, and that has to do with the water content in the tofu. I actually didn’t mind the look of the cheesecake at all, but I thought I’d mention it so that you won’t be surprised when you try the recipe. Feel free to decorate the cheesecake however you want. I piped some of my homemade whipped cream using a large star pastry tip. As you can see in the photo below, I didn’t use a proper piping bag for this, and that’s perfectly fine. Just cut off the corner of a sandwich bag, stick the piping tip through the hole, and you’ll be good to go! DO NOT remove the cheesecake from the pan before it cools!! When the cheesecake is still warm, the edges are sticking to the sides of the springform pan. If you loosen the outer ring, it can rip the cheesecake down the middle. I learned this the hard way. Let the cheesecake cool at room temperature and then refrigerate it in the pan for a few hours before releasing the cheesecake. It’s also a good idea to run a butter knife along the edge of the pan to ensure that the edges of the cheesecake aren’t sticking to the pan. 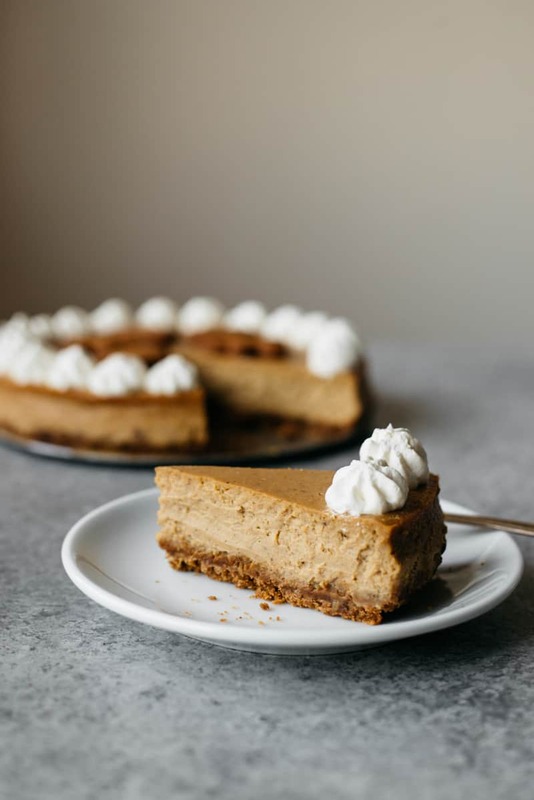 Make sure to use soft tofu: For the smoothest cheesecake, you’ll want to use soft (or silken) tofu and blend it in a blender or food processor. Cover the bottom of your pan with foil: Because we’re cooking the cheesecake in a hot water bath, we need to cover the bottom of your springform pan with foil to prevent water seepage. Using a pan for the water bath: If you don’t have a roasting pan that’s large enough to fit a cheesecake, don’t worry. I used my 12-inch skillet for this, and it worked wonderfully. 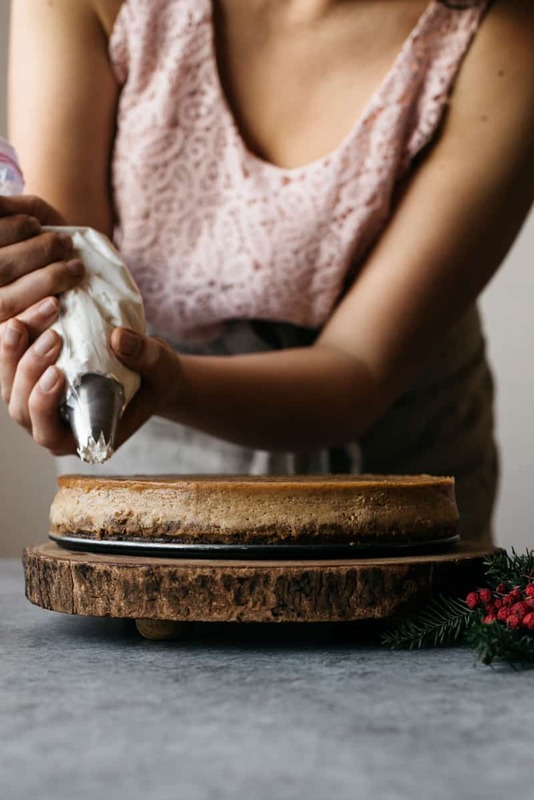 Refrigerating the cheesecake: When you’re refrigerating the cheesecake in the pan, make sure to cover the pan with a layer of paper towels first before wrapping it in plastic wrap. A lot of moisture tends to build up on the cheesecake, and the paper towels help prevent some of that moisture. You can also lightly dab the top of the cheesecake with paper towels to wipe off the moisture. Remove the block of soft tofu from the container and wrap it with 2 sheets of paper towel to absorb the moisture. Set it on a plate while you prepare the crust. Preheat oven to 350ºF (175ºC). Place an oven rack into the lower third position. Tear out 2 large sheets of heavy duty aluminum foil. Make sure that the sheets are large enough so that you can wrap the bottom of the pan. Take a sheet of the foil and set the pan on top. Gently fold the foil up the sides of the pan and press it firmly along the sides. If you have extra foil running over the top of the pan, gently fold them around the top edge of the pan. Place half of the graham crackers in a sealable plastic bag. Roll a rolling pin on top of the bag to crush the graham crackers. You can also smash the crackers with a kitchen mallet or pulse them in a food processor. Empty the crumbs into a medium-sized bowl. Add the rest of the crust ingredients and mix everything. You may need to use your hands to make sure that all the crumbs are moistened. Press the crumbs into the bottom of the springform pan. Make sure that the crumbs fill the entire bottom surface. Bake the crust for 10 minutes. Let the crust cool while you prepare the filling. Reduce the heat to 325ºF (163ºC). Remove the paper towels that are wrapped around the tofu. Place the entire tofu block into a food processor and blend until it is completely smooth, like the consistency of yogurt. 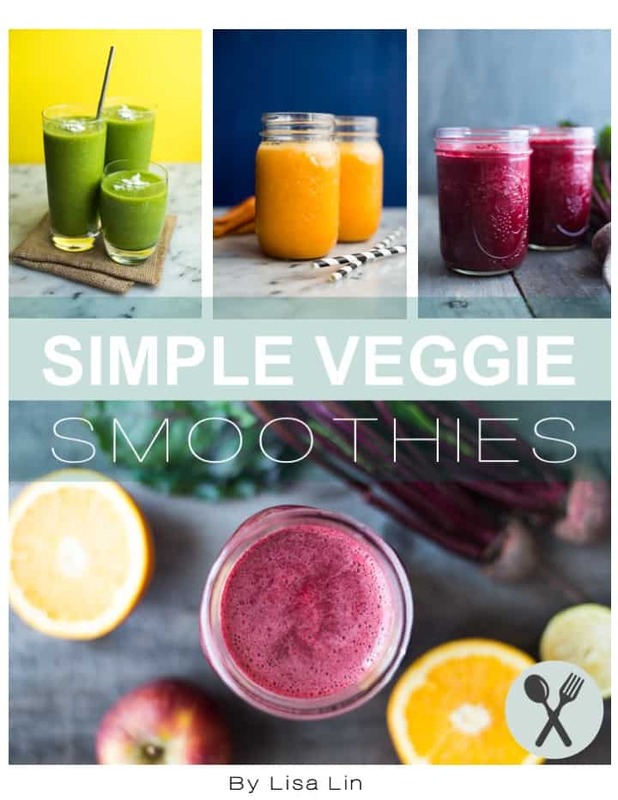 You can do this in a high-speed blender, too. Empty the creamy tofu into a large bowl. Add the cream cheese and beat at medium speed for 4 minutes. Add the sugar and beat again for another 2 to 3 minutes. Next, beat in the eggs, one egg at a time. Add the molasses, vanilla, ginger, cinnamon, nutmeg, cloves and salt and beat the batter until everything is incorporated, about 1 to 2 minutes. Set the batter aside. Bring about 1 to 2 liters of water to boil. Pour the cheesecake batter into the springform pan. Set the springform pan into a large roasting pan or a large cast iron skillet. 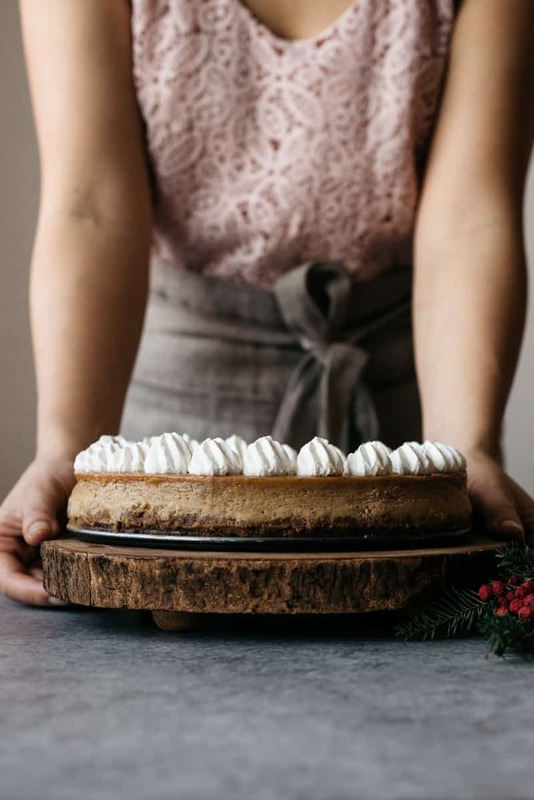 Carefully pour the hot water into the roasting pan or large cast iron skillet, creating a water bath for the cheesecake. You want to pour enough water into the pan so that the water reaches about halfway up the sides of the springform pan. I like using a kettle or a measuring cup with a spout to do this so that no water splatters into the cheesecake. Alternatively, you can pour the water into the roasting pan or cast iron skillet first before setting the springform pan inside. Bake the cheesecake for about 1 hour 30 minutes, until the filling is set. Let the cheesecake cool at room temperature for about an hour before chilling it in the refrigerator for 3 to 4 hours. 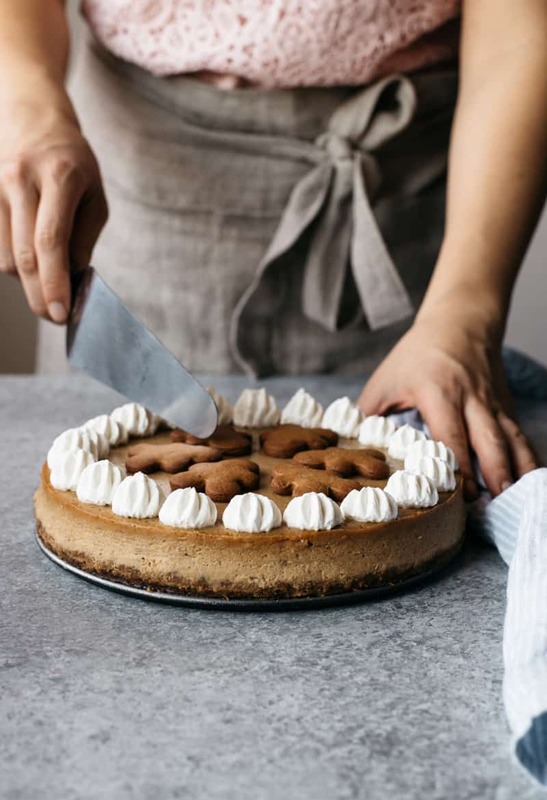 Before you release the cheesecake from the springform pan, make sure that you run a butter knife along the sides of the cheesecake to make sure that it’s not still sticking to the pan. 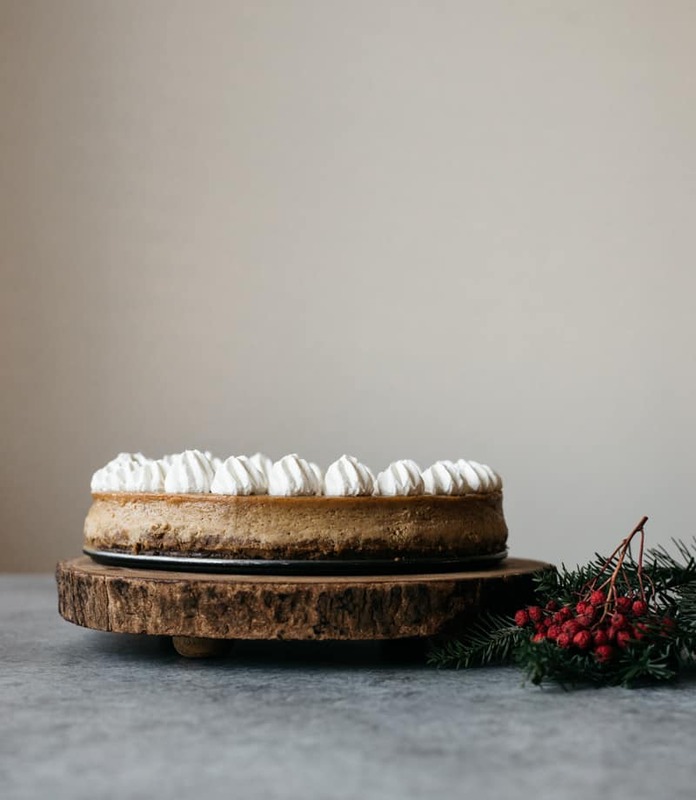 Decorate the cheesecake with piped whipped cream and gingerbread biscuits, if you like. Disclosure: This is a sponsored post written on behalf of House Foods. 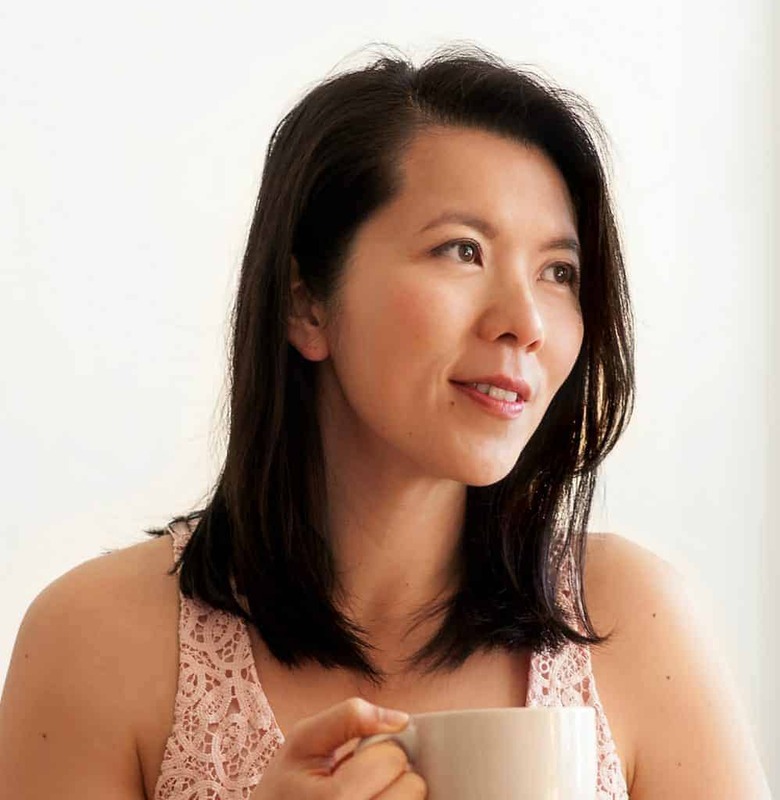 Thank you for supporting the brands that keep me inspired in the kitchen! To stay up to date with House Foods or to get recipe inspiration, visit their website or follow them on Facebook or Instagram!